Here are a few of my own words about the art of trusting your First Logo Design Idea, as the true ‘gut instinct and reaction’ to the project in hand. In recent years, and certainly in the last few, I have come to trust some of initial ideas that pop into my head when working on a new logo design, and/or graphic design project. Experience has shown me that more often than not, these ideas are the ones that eventually find their way to the final design. If I subsequently think of more ideas after this first initial idea, I have found that my heart will not be in this ‘exploratory mood’. I will generally feel that I am wasting time in exploring other ideas. That I ought to be focusing my energies and creativity on perfecting this ‘first idea’. I often feel that to force more ideas just because you feel you have to, or it’s expected from clients or superiors, when that first idea seems to hit the mark, can drive you to loose momentum and focus. It’s all very well feeling pleased that you have come up with half a dozen ideas, but ultimately you will only use one. For me, there is usually only one right ‘base idea’, and that’s the idea that my working inner self tends to provide me. It’s important to clarify that when I say ‘base idea’, its the initial concept, the general focus and structure of the design. Perfecting the details are not so clear, but I am talking about that first ‘brain wave’, that first concept that pops into your head. That’s the one, on average, I will work with and explore. Sometimes it can be a complete idea, with little perfecting, other times it will be that ‘base concept or idea’ that hits me. Other ideas will not seem to hit the mark as well as the first one. It’s not always so clear cut of course. We each have our own methods of idea exploration. Often it does take time and idea after idea to come up with that final winning version. Maybe this reliance on that first ‘gut idea’ ultimately develops through experience gained. It can also be attributed to good old self confidence, which is not necessarily just down to experience, time spent working and learning from mistakes. The whole formula of experience/confidence/skill set is a complicated one. Look back on previous logo projects, take a look and see how many ideas were crafted from that ‘first born idea’. Even if you subsequently explored other concepts, how many times can you point your finger on that completed project? The one that owes it’s very existence to your ability to interpret the brief and have your brain come up with a visual answer within moments of thinking about it? When you can do that, when you can see a pattern emerging, you may be in a position to alter your entire design process for something more rewarding and ultimately more productive. It’s not mandatory for logo and graphic designers to always provide 4-8 initial ideas for the clients, it’s often just a waste of time and money. The client feels they are getting value for money. In many cases, you are just reducing the time you could have spent on deeply exploring that possible winning ‘first idea’. Having the confidence to present that ‘first idea’ to the client as a starting point. Too many options can be crippling and an effective waste of time. It’s rare to be able to work on and subsequently submit 3-6 brilliant and equally viable logo ideas, it’s often hard enough to find one. Yet many logo designers seems to put themselves through this time consuming process. Often the multiple ideas, for the clients to choose from are weaker than the well researched and committed one idea. So who benefits from this process of quantity over unique quality? The client is not really paying you for how many ideas you can come up, they are paying you for your ability to provide them with a suitable logo and brand identity. So why spend time on 6 other ideas, when you could possibly have the winning idea already in your hands, and spend that time ‘really’ exploring those first few ideas? 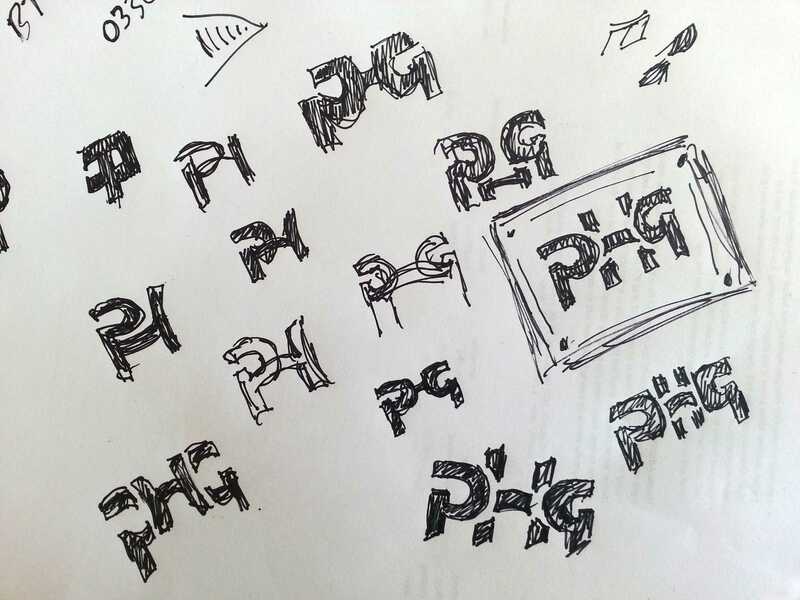 Some clients approach me expecting to see multiple first ideas in the first opening salvo, that they often associate this with the process of logo design as a whole. I explain this is not the case, at least as far as I am concerned. I explain ‘my’ process and so far, not one client has turned away. It just comes down to how confident you are in your own methods, and of course being able to deliver the goods at the end. The client ultimately wants one winning logo, not 6. As with any ‘opinion’ or ‘point of view’, it is subject to different perspectives or argument. I am not saying that every first idea IS the best one. That you should never ever explore other options, that would be pretty naive and arrogant. What I am trying to point out that in some cases, your initial assessment after reading the brief can be spot on, and that you rely on your confidence to see it through. Or that you don’t just blindly come up with 6 ideas when you have a strong feeling that only one or two are even worth submitting. It’s about trusting your instinct when ideas and thoughts come to mind, and bucking the trend if your gut is shouting at you. I am sure though, that regardless of how old you are, how many years of experience you have, everyone has the potential to have that winning ‘first idea’ pop into their had. The trick is to trust that idea and work on it.